Tucked away on California’s North Coast amongst the giant Redwoods, Gold river Lodge is the perfect steelhead retreat on the Klamath River. The Klamath River, historically, was home to one of the most prolific runs of steelhead in the world. Zane Grey, Trey Combs, Bill Schaadt, and countless other legendary anglers once tread its gravel-lined banks casting flies for the river’s well known half-pounders, and, adult steelhead. The new addition is the Bansemer family and Gold River Lodge. Jim Bansemer, drawing from an esteemed home construction background, custom-built the lodge in the summer of 2007 and now operates with the help of his son, head guide, and property manager, Kenton Bansemer. 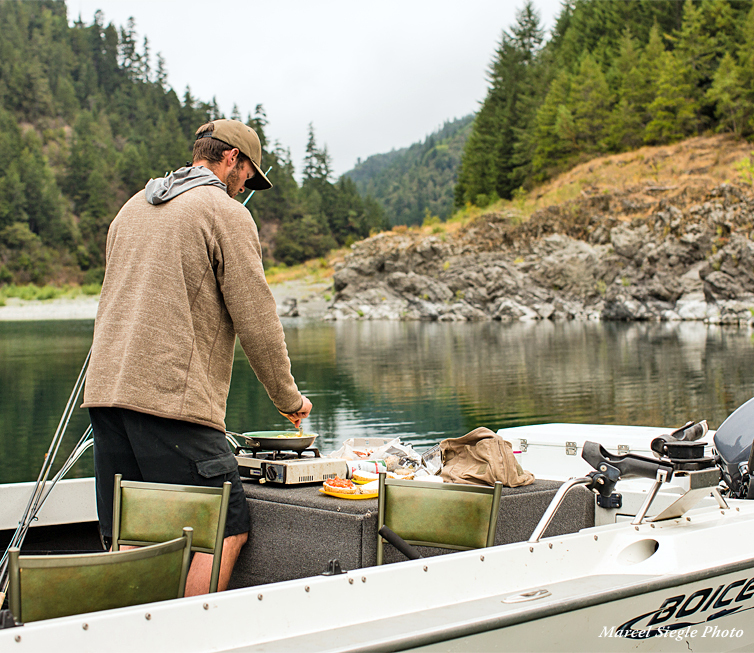 The Bansemer’s pour their passion for fishing and service into every glass of wine, savory meal, lodge detail, and second of the long fishing days on these fabled Klamath River runs. It’s no surprise they have developed a strong core of guests who return year after year not as clients, but friends and family. 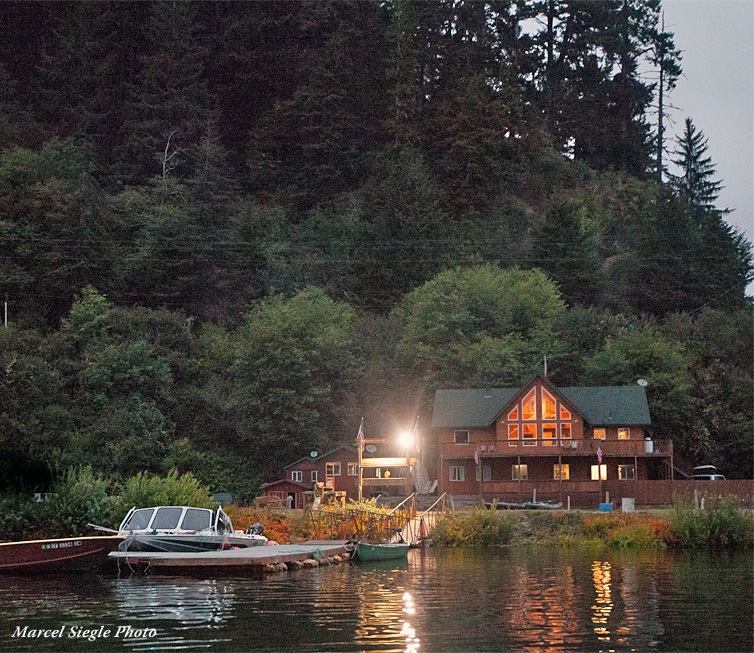 The lodge sits perched just above water’s edge on the north bank of the river, only a stone’s throw from where the mighty Klamath meets the sea. 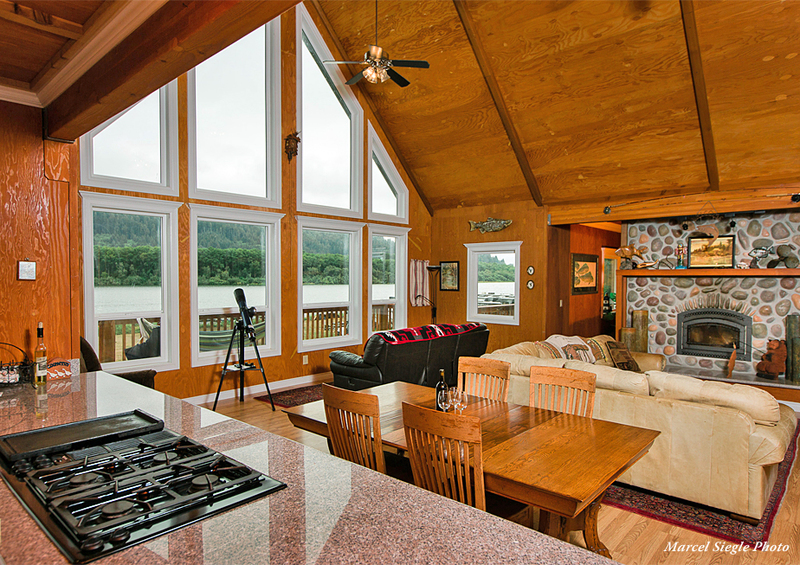 Fresh smoked salmon, ocean air and spectacular views of the Klamath’s estuary and wildlife can all be enjoyed from the comfort of the back balcony. 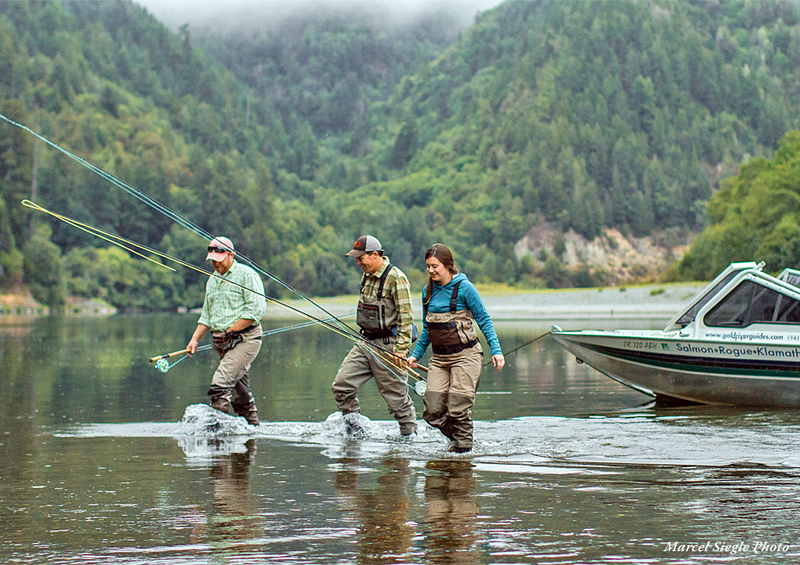 It is a step back in time to the days of “steelhead lore,”, and every guest at Gold River Lodge walks away relaxed, a pound or two heavier, and with plenty of memorable fishing stories. The fishing program at the lodge is focused mainly on the steelhead and salmon runs of the Klamath River in the summer and fall, and the mighty coastal steelhead of Southern Oregon’s Chetco, Elk, and Sixes Rivers during the winter months. 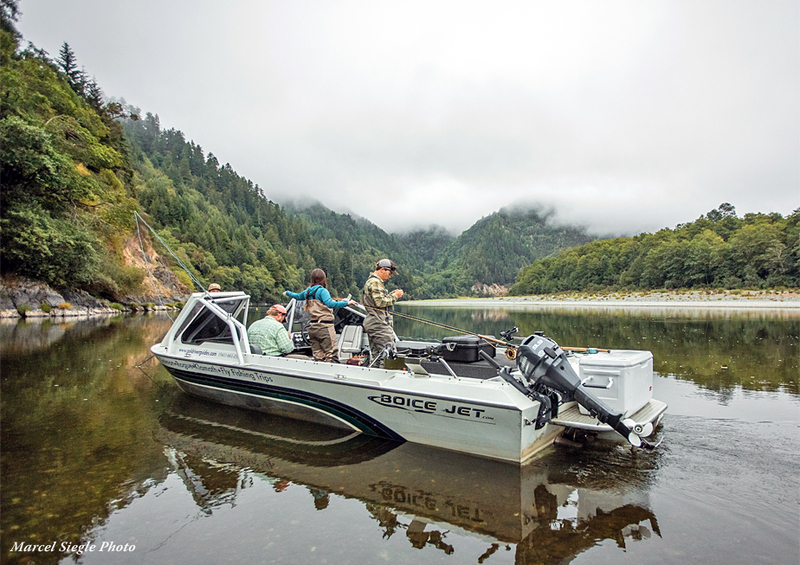 On the Klamath, jet boats are used to shuttle from one long sweeping steelhead run to the next while rafts are deployed to float wild and scenic sections of Oregon’s coastal rivers. The lodge’s dead-center location allows for incredible flexibility to fish where the fish are and where the conditions are best. Anglers can change locations every day, or stay where the fishing’s hot! 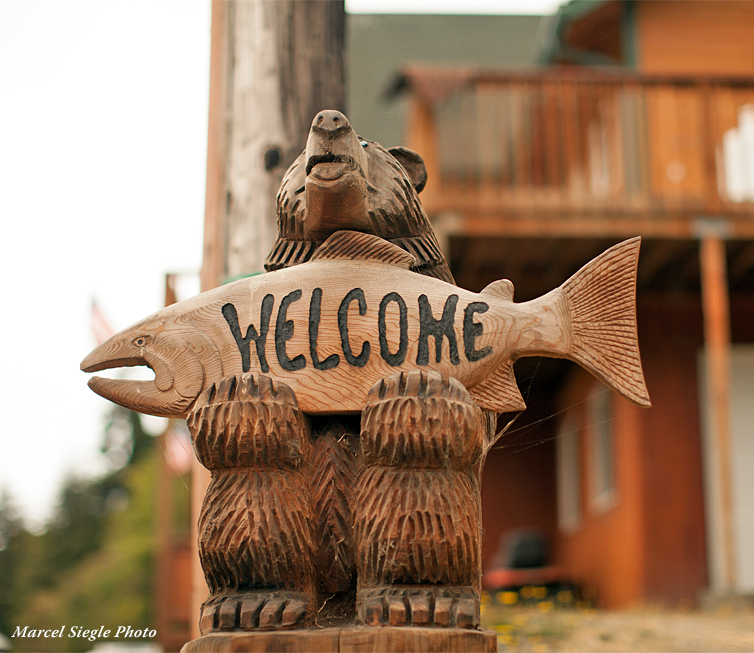 Included in your lodge package at Gold River Lodge is all meals, accommodations, guided fishing and access to all the lodge facilities. Not included in your lodge package at Gold River Lodge are fishing licenses, steelhead cards, waders, rods/reels, and terminal tackle (flies, tippet, etc.) Some of these items are available at the lodge, for an additional fee, but you will want to make arrangements with the lodge in advance. Non-angling companions are welcome and have a wonderful opportunity to explore the beauty of the rugged Northern California Coast. With awesome Redwood hiking trails and wildlife viewing surrounding the lodge, sometimes it's easy to forget about the world class fishing just outside the back door. The fishing program at the lodge is focused mainly on the steelhead and salmon runs of the Klamath River in the summer and fall, and the mighty coastal steelhead of Southern Oregon's Chetco, Elk, and Sixes Rivers during the winter months. Spring salmon start to arrive this time of year, gathering in good numbers in the estuary while preparing to start their journey up river. This is the time to target bright King Salmon on a fly in the Klamath River's estuary, as so many fly fishing pioneers have done in centuries past. A King Salmon is still one of the great gamefish in the world of fly fishing, and anglers who have experienced their ferocious power understand exactly why. Steelhead fishing on the Lower Klamath gets going around mid-July as both adult and the famed "half pound" steelhead begin to trickle in from the Pacific. The early season fishing on the Klamath is always interesting and exciting as anglers have the chance at connecting with both adult steelhead and king salmon in the same run! Steelhead runs will peak in August while chrome bright fish continue to enter the river through September. This is prime time steelhead fishing on the Klamath and there is absolutely nothing better than feeling the grab from a red hot Klamath River steelhead. Swinging flies on the long, broad runs of the Lower Klamath River with single or two-handed rods is the preferred method for targeting steelhead for most guests staying at Gold River Lodge. This is for good reason; it is hard to find a river better tailored to swinging flies. Floating lines and flies fished just under or on the surface, early or late in the day, are the norm here. Very light sink tips and wet flies can also be employed with success during the day when the sun is higher in the sky. Flies fished dead-drifted, usually under indicators, have also proven to be very effective. No matter your preferred fishing method, the guides at gold river lodge have a passion for fishing, teaching, and making sure your time on the water is successful. The fall season on the Lower Klamath is arguably the most scenic backdrop an angler will ever encounter. The combination of the fall colors, cool coastal air, and overall remote and wild nature of the river make it a destination worthy of any anglers bucket list. 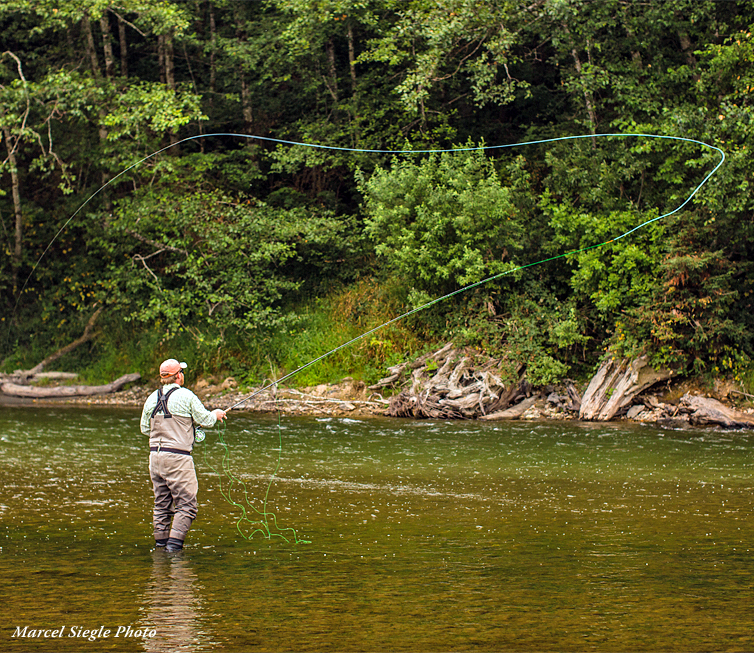 September sees the river full of both steelhead and Fall Run King Salmon. The fall run of Kings begin showing up in late August and tend to overlap with the spring run, most years. In addition to the steelhead and King salmon, Coho Salmon enter the river beginning in mid-September and are very willing to grab a swung fly. Coho's are inherently aggressive and finding a pod of them moving up river usually results in fast and furious action. Full fall colors are in affect through October and November and there are still plenty of salmon and steelhead moving through the lower river to make fishing worthwhile. Towards the end of November a winter run of steelhead enters the river. Though tough to target due to fluctuating water conditions, these larger wild winter steelhead are well worth the extra time and effort. 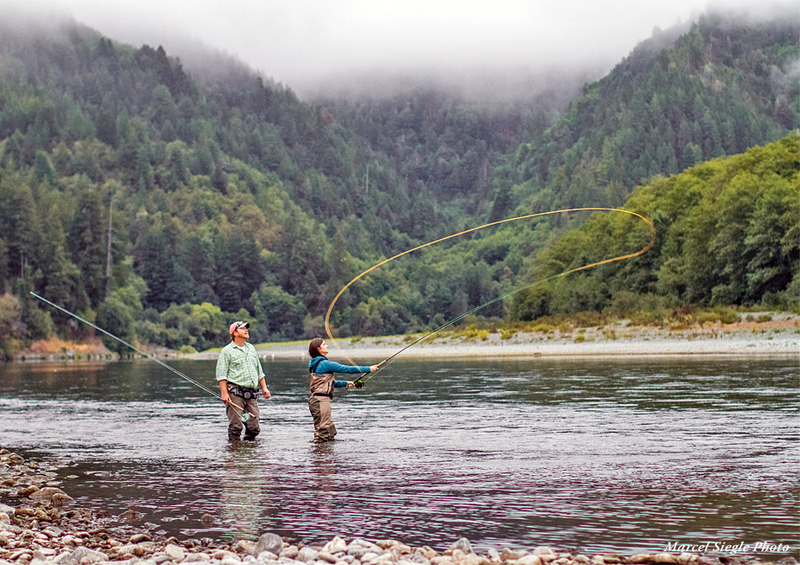 During the winter months the guides from Gold River Lodge focus on steelhead and fishing on the coastal rivers of Northern California and Southern Oregon such as the Smith, Chetco, Elk and Sixes. Typically the first good pushes of winter steel show up with the first significant rains following Thanksgiving. The peak of the steelhead runs on the coastal rivers is from late January through early March and the Southern Oregon fisheries provide action well into April. Crowds tend to be minimal later in the season, and often times fishing in late March can produce some of the most memorable outings of the season. The guides at gold river lodge are fortunate to hold one of the few permits that allow them access to fish the wild and scenic section of the Upper Chetco River. Only a handful of guides hold this permit and fewer actually utilize it. This less- traveled section of river only sees a handful of anglers compared to the often crowded lower end. The method of fishing here is entirely up to the angler. Indicator setups can be fished from the raft, or anglers can employ spey rods, skagit heads, sink tips, and bushy flies in an attempt to elicit the heart stopping grab of a wild winter steelhead. fishing. A washer and dryer are also available for guest use to ensure that all fishing gear is clean and dry at all times. For those who need to stay connected, an office and wi-fi are also available. If you don't want to miss the big game there is a flat screen T.V. in the lounge will bring you all the action. Guests do not go hungry when staying at Gold River Lodge. 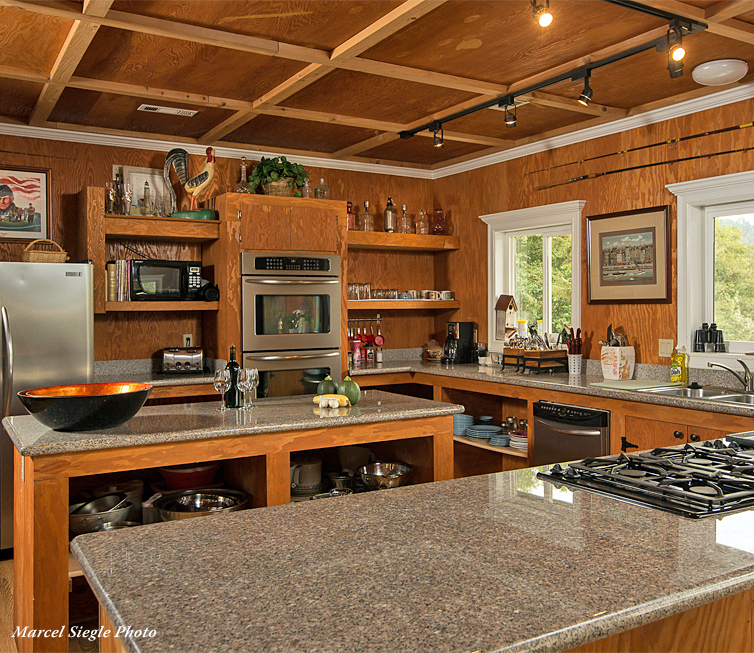 Jim Bansemer, a ten year gourmet chef, will be taking care of the menu during your stay at the lodge. 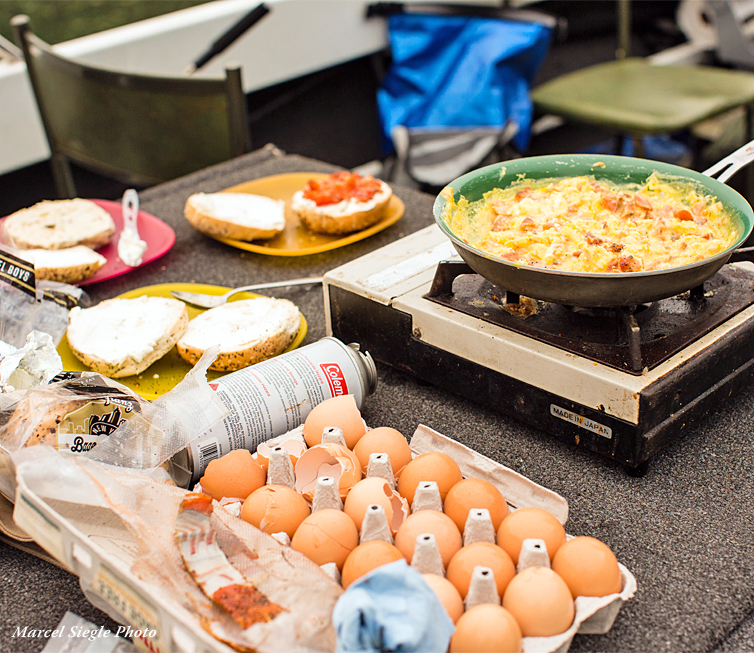 Your day starts with a hot breakfast, your choice of omelets, pancakes or waffles, fresh fruit, juice and coffee before heading out to the jet boats for your days fishing. 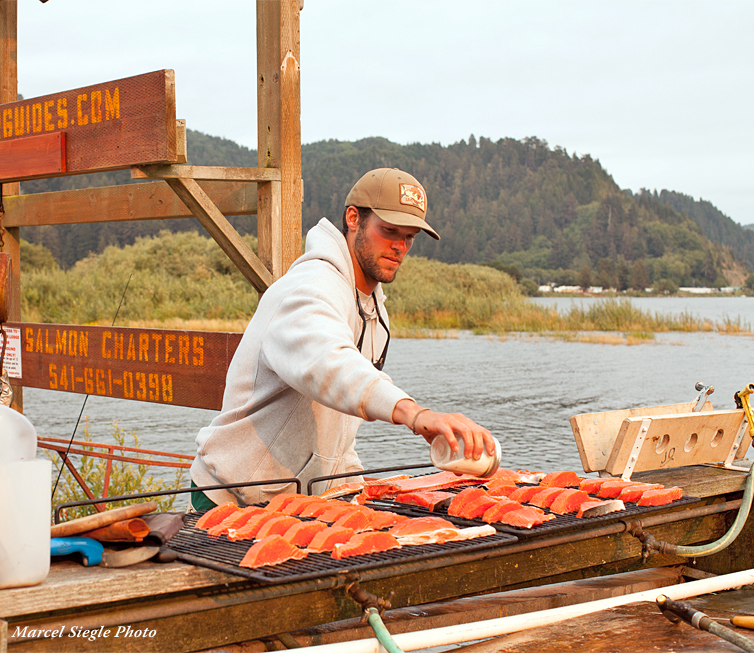 Delicious shore lunches are made on the rivers gravel bars and feature a variety of fresh, local ingredients. Smoked salmon cream cheese bagels are a favorite of many! 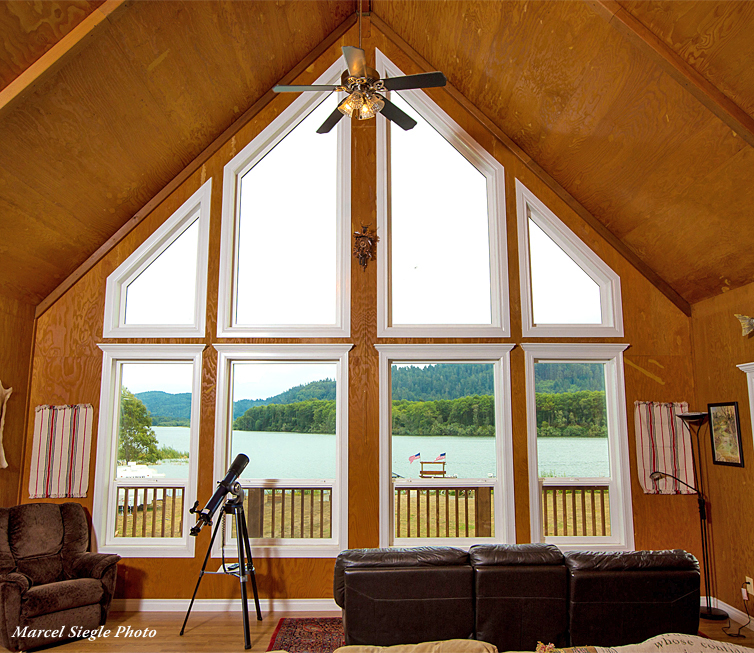 Once back at the lodge relax with fresh appetizers, ocean air and spectacular views of the Klamath's estuary and wildlife from the comfort of the wrap-around back balcony, only a stones throw from where the mighty Klamath meets the sea. Dinners focus on a variety of fresh seasonal ingredients. Fresh seafood chowders, crab, halibut, ribs and barrel roasted chicken are all part of the menu. Allergy friendly menus are also available for those with restricted diets. Due to the remote nature of the lodge, it is important to bring any choice beverages or foods with you as these items will most likely not be readily available for purchase near the lodge. Too, we ask guests to enjoy cigarettes and cigars outside, on the back balcony or anywhere else on the property. The terms "remote", "wild" and "solitude" are not usually the first to come to mind when someone talks of outdoor recreation in California. The reality is that, tucked away in the north western most part of the state, few places in the lower 48 are as remote, wild and solitary is what you will find at the Gold River Lodge on the Lower Klamath River. attraction all its own, with beautiful views and unique coastal communities dotting the map along the way. The closest municipal airports are located in Brookings, OR (45 min north) or Mckinleyville, CA (45 minutes south). These are not major airports, so finding flights may be tricky. Flying into Redding, Sacramento or Medford, renting a car and enjoying the drive is preferred by most.